We're three months into the new year already, and it's the beginning of National Nutrition Month®, an exciting time for dietitians to discuss and take part in events that highlight the importance of making knowledgeable food decisions and developing healthful eating and physical activity habits with clients and patients whether you work in private practice, foodservice, retail, consulting, or the media. This year's theme is "Go Further With Food," emphasizing the necessity of eating healthful foods and preparing "meals and snacks in advance to reduce food loss and food waste," according to the Academy of Nutrition and Dietetics, the creator of the annual nutrition education and information campaign. Food waste is a huge problem worldwide and has been for several decades. Many believe decreasing it starts at home with consumers and at every stage of the food supply chain. According to the Food Waste Reduction Alliance, an initiative of the Grocery Manufacturers Association, the Food Marketing Institute, and the National Restaurant Association, food waste is defined as any food that's discarded during processing, handling, storage, sale, preparation, cooking, and serving. The amount of food wasted in our country is staggering. Did you know that 25% to 40% of food grown, processed, and transported in the United States will never be consumed? It's estimated that in 2010, 60 million tons of food waste were generated in the United States alone, and of that 60 million tons, nearly 40 million ended up in landfills. Worldwide, 1.3 billion tons of food are wasted annually, enough to feed 2 billion people without additional impact on the environment, according to the Food and Agriculture Organization of the United Nations. So nonretail and retail dietitians have much to discuss with clients and shoppers, respectively, about healthful eating, meal planning, and strategies to reduce food waste. For starters, RDs can suggest consumers take inventory of their pantries before grocery shopping so they buy only what they need, use shopping lists to avoid impulse purchases of foods they may not eat before they spoil, freeze foods for future meals, and prepare smaller portions. For more information on this topic, read the article "Reducing Food Waste," in the May 2016 issue of Today's Dietitian. In celebration of National Nutrition Month® and Registered Dietitian Nutritionist Day, Today's Dietitian is publishing our ninth annual "TD10" feature, which includes profiles of the top 10 dietitians you helped nominate for their outstanding work in the nutrition field. 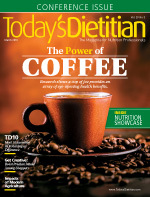 Enjoy reading their stories and the other articles on how retail RDs around the country are increasing produce intake, the health benefits of coffee, and the impacts of modern agriculture. Please enjoy the issue!